I think we can all relate to his obsession with the wonders of YouTube. 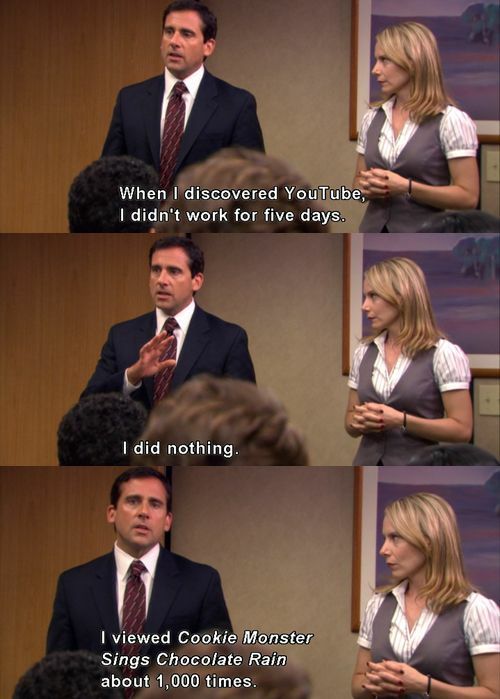 But little did he know, there’s a way to turn YouTube binge-watching into a productive activity! Instead of losing five days of work to a silly video, you can use YouTube to achieve your goals—especially if one of your goals is getting good at Portuguese. Learning Portuguese on YouTube is easy thanks to the ability to add subtitles to any video and the wide range of content available. When you have animations, comedians and impossibly cute vloggers as your teachers, your language-learning regimen will get a lot more exciting. Here’s a look at five awesome channels that’ll help you beef up your language skills on YouTube, and have fun doing it. Get ready to be all ears—and eyes and mind—for these five channels that’ll make learning easy-peasy-Portugesey. We’ve included a few different styles, so you’re sure to find your new favorite YouTube channel to learn Portuguese with here. If you have any trouble understanding the Portuguese speech, just turn the subtitles on for some extra help. 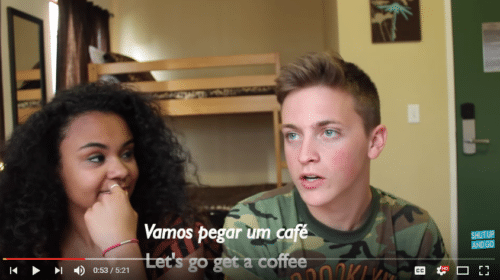 YouTube’s generated subtitles aren’t always accurate, but they’ll get the idea across—and many of these videos actually include subtitles of their own, so you know you’re learning your Portuguese the right way. And if you love learning with YouTube videos but wish the subtitles were 100% trustworthy, you’ll enjoy using FluentU to learn once the Portuguese program is available. FluentU takes real-world videos—like music videos, movie trailers, news and inspiring talks—and turns them into personalized language learning lessons. Videos come with interactive subtitles: Just click or hover over any word to see its definition and even other videos that use it! Find an interesting new word? Add it to your vocabulary list. FluentU’s an all-in-one immersion program that YouTube addicts are sure to love! A Portuguese learning program is currently in development, so stay tuned for an immersive, authentic way to learn Portuguese, coming soon. Without further ado, let’s dive into this internet video bonanza with an appetite for Portuguese and a penchant for constantly discovering new things. It’s no secret that books for children are valuable beginner’s resources for learning a language, thanks to their accessible vocabulary and simple sentence structures. Well, BookBox takes this learning opportunity one step further by turning children’s stories into animations with subtitles. BookBox offers numerous animated stories in an impressive number of languages, setting out to address the issue of widespread illiteracy among children worldwide. As a result, all their stories are handpicked in accordance with the principles of “edutainment,” which mixes learning with having fun. One of BookBox’s best features is a karaoke-like subtitle interface, highlighting every word in perfect timing with the audio narration. This means you’ll be developing both your listening and reading skills simultaneously. The BookBox Portuguese collection on YouTube includes 13 videos, ranging from your typical cutesy, animal-centered stories to more complex ones that feature families or even religious characters. It’s worth mentioning that all BookBox content has a message of love and acceptance and strives to be as culturally inclusive as possible. Watching the videos is as entertaining for adults as it is for kids. In fact, it’s actually a surprisingly soothing experience thanks to the slow pace of the narration, complemented well by the relaxing background music. The audio narration in itself is very well done with a clear Brazilian pronunciation, smooth but expressive when the story requires it. Adding to this, the visual element is elegantly simple, with watercolor-style illustrations and subtle transitions between scenes. I strongly recommend BookBox videos for bootstrapping that basic vocabulary and for training your visual learner side by making image-text associations. The short animations are also a good medium for continuous self-assessment, as they can be revisited over and over again in order to see how many words you can recognize each time. This is especially effective if you take the time on the first viewing to look up words you don’t know and then write them down on flashcards, turning the videos into a spaced repetition practice session. Psy Logic Drawing is, to my knowledge, the only channel of its kind in Portugal, a country not renowned for its rich video culture. For that alone, the makers of these videos deserve mad props. As the name indicates, the channel specializes in psychology-related topics, tackling one per video in a quite enjoyable way using whiteboard doodles! Indeed, the “drawing” part of the name refers to colorful illustrations drawn right before your eyes in perfect sync with what’s being said to you (in 100% European Portuguese, no less). This fun technique makes the information very approachable and attractive, and also helps to make complex psychology topics—and the vocabulary that comes along with them—more digestible and easier to grasp. It’s worth mentioning that the narration is a bit on the fast side, and can be troublesome for those listeners who aren’t used to the continental Portuguese accent. So this channel would be most appropriate for an intermediate level of listening comprehension, at least. That being said, the diction is impeccable and the pronunciation very careful, so once you get the feel of it, it’s quite easy to “catch” the words as they’re being uttered. Not to mention, of course, the accompanying subtitles (which you can toggle between Portuguese and English by clicking the “Settings” gear logo in the lower right-hand corner of the video). I love getting a hefty dose of knowledge while also getting my language skills on point, so this channel ticks all the right boxes. And if you think Psy Logic Drawing comes packed with ultra-specialized terms and concepts, think again. Throughout the videos, you can observe a wide range of topics, from the “Pokémon Go” frenzy down to the mechanisms of procrastination. The latter of which, by the way, needn’t concern you anymore now that you’re doing something productive—learning Portuguese, that is—with YouTube, the largest procrastination Mecca there is! The phrase como se faz literally means “how it’s made,” so you can guess where this is going. Originally integrated into Económico TV’s show “Projecto Empresa” (“Project Enterprise”), the “Como Se Faz” series has its own dedicated playlist on the TV channel’s YouTube, totaling 39 videos. What you’ll get is a video rundown of how different things are made, from the factory to the final form that we find on store shelves. The episodes focus not only on widely familiar objects (like Coca-Cola and McDonald’s hamburgers) but also on cornerstones of Portuguese consumption, such as Nestum cereal and Pastéis de Belém (a Portuguese custard tart delicacy). These “how it’s made” videos can be absolutely mesmerizing and at times mouthwatering (don’t watch the Pastéis de Belém one hungry), so they’ll have no trouble in effortlessly drawing your attention. There are no subtitles available but just like with Psy Logic Drawing, the clean European Portuguese enunciation and easy rhythm do a great job of facilitating understanding. Plus, the video’s main ideas are punctuated by on-screen phrases à la “Pop-Up Video,” providing an extra aid to the overall comprehension of what’s going on. I find this show great for doing some extensive listening practice, taking in the musicality of the language and getting accustomed to hearing words in context. Feel free to also jot down any word whose meaning you’re not familiar with and don’t be afraid to get experimenting with context clues and try to determine the definition. For example, say you watch the “Como Se Faz” video on how IKEA furniture is made. You keep hearing the word madeira in correlation to images of pieces of wood, thus deducing that madeira might be Portuguese for “wood.” Write down madeira in your best estimate of its spelling and then check for the translation. Start by looking up the Portuguese word for your original hunch (in this case, “wood”) and if that hunch proves to be a correct, pat yourself on the back! If not, start researching the word madeira with your favorite Portuguese dictionary or translator until you find something that fits the context. Such a simple exercise will teach you not only the meaning of random words you hear, but also persistence, logical correlations and the importance of context in learning vocabulary. And with a resource like this YouTube series at your disposal, you’ll actually enjoy looking for Portuguese language Easter eggs! Here’s a YouTube channel that’ll help you learn Portuguese, but will also have you in stitches. A winning combination? I certainly think so! The well-established Brazilian comedy group Porta dos Fundos (Back Door), or Porta for short, rose to internet fame years ago through their short sketches tackling current events and social phenomena with their own unique brand of humor. Since the material is made up of realistic human interactions, expect fast-speaking, slang-infused Carioca talk, as well as words and expressions that would make your grandma blush (if she could understand Portuguese). If you’re looking for authenticity in your language learning, then you’re in the right place for some unmistakable Brazilian feel. If you’re not such a fan of practicing with informal material, know that some episodes do tone it down to a more intelligible “vanilla” form of the language. Most importantly, all the videos are subtitled at least in English, but most of the time in a combination of popular languages—there are sometimes up to six options for one video! Portuguese itself was for a long time absent from this subtitle mix, to the discontent of many learners coming to the Porta channel for language practice. However, it eventually became available as a subtitle option, so make sure to hit their more recent videos if same-language subtitles is your jam. The fact that subtitles are displayed in so many languages is a great bonus for those of you who are studying Portuguese as a third or fourth or nth language. By setting the subtitles in another foreign language that you feel more confident in, you’re DJing at two turntables at once, so to speak, and are actually getting a good workout for both. The content, as I said, is hilarious, plentiful and unapologetically Brazilian, so it’s not exactly your run-of-the-mill learning resource. Surprisingly enough, the episodes at times touch on issues quite pertinent to acquiring a language, such as one particular video episode that does an excellent job of showing the role played by context and culture in understanding a language. No matter the episode, the funny is always there and you have tons of episodes to choose from as they upload new content often and usually accompany it with equally entertaining “making of” videos. So when you become hooked to Porta dos Fundos, you can rest assured knowing you’ll never run out of viewing material. I’ve been feeding my wanderlust with the videos of dynamic duo and polyglots Damon and Jo for years but only recently did I realize how perfect they are for boosting my Portuguese. For starters, the two travel vloggers are great at giving you that “I really want to go to Brazil/Portugal/the world” feeling, which in itself is great because the next thing you know, you’ll be packing your bags and getting real life language immersion in a hot, sunny place. But until that happens, this channel has some other notable advantages that can be enjoyed from the comfort of your room and pajamas. Between the two of them, Damon and Jo are fluent in five languages, including Portuguese, of course, which also happens to be Jo’s mother tongue. In fact, their most substantial playlist is called “Em Português” (in Portuguese) and contains over 90 videos (and counting!) either filmed entirely in Portuguese or focusing on aspects of the Portuguese language. It’s quite a treat to watch Jo teach Damon how to hit on Brazilian cuties in proper native vernacular or get a lesson in palavrões (bad words) from her grandmother. Their teachings steer away from contrived textbook Portuguese and instead contain authentic language and useful vocabulary that you can use in your travels, so that you can have conversations with locals without sounding like a robot programmed 30 years ago. And because the target of these lessons is Damon, endearingly referred to as “gringo” in a few videos, you don’t feel like a student having to follow an instructor but rather like a fly on the wall in a casual, impromptu Portuguese lesson. The tone is relaxed and their energy is infectious, so not only will you be memorizing all the language bits easily, you’ll be doing so while sporting a big wide grin for the duration of their videos. To add to this generous playlist, you can also find several clips they made on their trip to Portugal as part of their travel videos collection (you’ll need to dig around to find the relevant videos as the playlist is pretty huge!). Here, not only do you get a glimpse of Lisbon through their enthusiastic eyes, but you’ll also learn a few useful language tips, such as how to order coffee in Portugal or the ins and outs of drinking ginjinha, Portugal’s trademark cherry liquor. Honestly, they’re so delightful it makes me want to learn all the languages they speak just so I can get more of them. They’re also kind enough to include English subtitles in all the portions of their videos where they speak Portuguese, so that you’re always in the know. So get in on the action and let their travel bug reach you through the computer screen while also getting a bit more Portuguese-savvy in the process! That concludes our rundown of learning Portuguese through YouTube, subtitled videos and general moving pixels on the internet. I hope you’ll indeed cast an eye on these five terrific channels that’ll make for a fun supplement to your more rigorous study efforts. All that’s left now is for you to press “play” and let the video “edutainment” begin! Clara Abdullah, 26 years of age. Her passport says “Romanian” but her heart says “Bora lá tomar uma bica!” (Let’s go for a coffee! ).